You've worked hard to make a great Esri Story Map app. But now you want to make it easy for people, including Esri's Story Map team, to find your work online. If your Story Map app uses a hosted Story Map application template from ArcGIS Online (such as the Esri Story Map Tour and Esri Story Map Swipe), then an ArcGIS Online item is automatically created in My Content. But if you deploy your Story Map app by downloading and hosting the Story Map application yourself, then you need to add a web mapping application item. 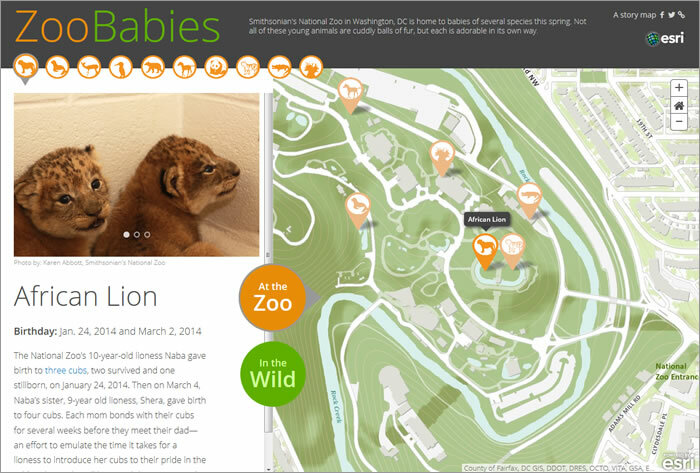 See Add apps for details and an example of a well-documented Story Map item. Add tags to your application item details to make them easy to find. Use the term "Story Map" and the name of the template you have used, such as Story Map Tour or Esri Story Map Shortlist. The Story Map team searches for Story Map apps shared in ArcGIS Online by looking for the Story Map keyword. Try the search. Adding the Story Map tag ensures your entry can be found by the Story Map team or anyone else who is searching using that keyword. The Story Map Gallery displays your item title, which doesn't necessarily match the title that users see when your actual Story Map app is launched. Take a minute to make sure that the title in your entry either matches or is similar to your Story Map title. Document your items well to help others understand your story when they discover it in ArcGIS Online. Add detailed and accurate descriptions, which will make your Story Map entry easier to understand and simpler for people to find. Include descriptive and accurate tags with your entry to make your Story Map app easier to find. If your Story Map entry is about a town in Australia but you don't have the word "Australia" as a tag or mentioned elsewhere in your entry, people who search for an example of a Story Map app set in Australia won't find yours. If a geographic region is germane to your Story Map entry, the Story Map team recommends adding the name of the state, territory, or province your Story Map app depicts, as well as the name of the country if it is not in the United States. If your Story Map app is in a language other than English, please add tags for a city, province, and country name in English so that it can be found easily via English-language searches. Also, add thematic tags that are relevant to your story, for example, "visitor guide" or "urban planning." The Story Map Gallery, and others, point at items in ArcGIS Online and display the thumbnail image from those items, so make sure your item has an attractive thumbnail. It can be a small screen capture of your Story Map application or one of the pictures or maps used in it. Thumbnails look best in the galleries if they are exactly 200 pixels wide by 133 pixels tall. It's important to complete your user profile, especially if you're representing an organization. This helps others assess the authority behind a Story Map app and tells users a little about the author. Adding an e-mail address in your profile is also recommended, just in case the Story Map team or someone else would like to contact you. Lure your audience into your story. Don't just label your story; be creative with your language. But don't make your titles—particularly subtitles—too long. Less is more, so make your words count. Avoid using abbreviations or acronyms unless you spell them out first; otherwise, readers unfamiliar with them will be left in the dark and will be less likely to explore your story. Story Map apps cover global topics. But only mention "Athens," for example, and someone won't know whether your story is about Athens, Greece, or Athens, Georgia. Consider adding region to your title or subtitle in addition to your description or tags. Read through your Story Map app carefully to eliminate typos or broken links. Ask a colleague to review it. If your users find a typo or error, it makes your map seem less authoritative and they'll be less likely to explore further. Look over your Story Map app on a different computer or from a different network than the one you used to author it. Make sure you try the story out when completely logged out of ArcGIS Online. These techniques will help you catch things like graphics that are too large and affect performance and map content that might not be shared properly. Most of the templates available in ArcGIS Online to create Story Map apps display the standard ArcGIS Online pop-up windows when users click features. Configure your pop-up windows so that they look attractive, excluding the extraneous, such as unnecessary fields. The Story Map team takes topics into account when deciding which maps to feature in the gallery and loves the creativity that authors demonstrate. However, the team is especially interested in finding and publicizing examples of Story Map apps that communicate the results of professional GIS work to stakeholders and citizens. These Story Map apps might present the results of spatial analysis, planning, or geodesign work. Story Map apps are a great way to expose your work and tradecraft to broader audiences. Story Map apps are judged by a lot of little things that, together, add up to whether your Story Map app makes it into the gallery. An interesting topic, good design, properly sized graphics, and a lot more are considered when a Story Map app is reviewed. You know a good Story Map app when you see one—make yours one of them. Rupert Essinger of Esri contributed to this tip.